Today during maths we were to finish off tasks we did not finish either this week's tasks, or the previous weeks tasks. 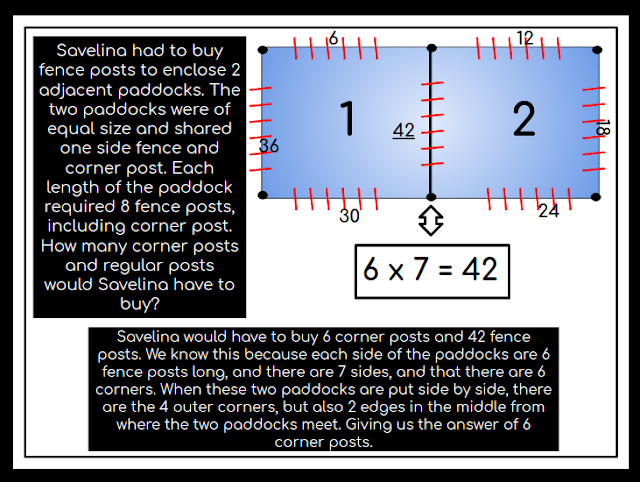 In this problem we needed to find out how many corner posts and regular posts would Savelina have to buy to enclose two adjacent paddocks. We found this task quite easy and hard at the same time because there were some bits that we struggled with, like writing a blurb in the DLO. Although in the end we solved it. We learnt a new word, adjacent. It means something or someone next to each other. For this activity, I worked with Fraidoon, Sanujan, and Ofa.